You know those skill-testing cranes at pubs, the ones that allow you to win a plush toy or chocolate bar? Well brewer Carlton Draught has built a ten storey one at the Melbourne Cricket Ground to allow those travelling to the Australian Rules Football finals a chance to really test their skills. 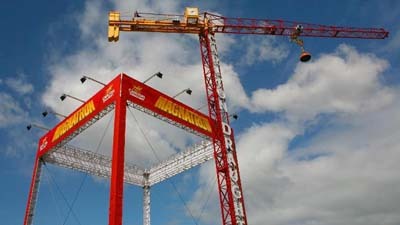 The enormous "Magnatron" is a giant game featuring a 30m crane and 750kg magnet constructed with CLSA trussing. 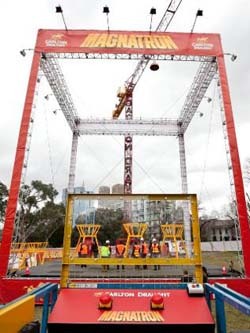 Constructed a week ahead of the AFL Grand Final this Saturday, $100,000 worth of prizes will be added to the base of the game for 14 contestants to try to pick up.